I am fundraising to international Antarctic Expedition(IAE) 2016 so that we can all save the coldest planet on this continent. 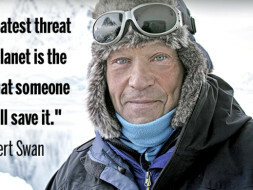 2041 was founded by polar explorer, environmental leader and public speaker Robert Swan, OBE, the first person in history to walk to both the North and South Poles. Swan has dedicated his life to the preservation of Antarctica by the promotion of recycling, renewable energy and sustainability to combat the effects of climate change. He has removed 1,500 tons of rubbish from the Antarctic, has reached out to over 35,000 African youth and has taken over 550 young people, teachers and corporate heads on his Antarctic journeys. The mission is to build personal leadership skills among people who choose to embrace the challenge of sustaining all forms of life – in their families, communities, organizations and the planet. The vision for 2041 is to have committed youth leaders, emerginf from every corner of society and working together to create a sustainable world. Human activities in Antarctica are governed by an international agreement known as the Antarctic Treaty System, established in 1959. This unique international agreement ensures that Antarctica is used for peaceful purposes only and that the environment is protected. Currently there is a moratorium in place that bans drilling or mining in Antarctica called the Environmental Protocol, established in 1991. This document can be reviewed after the 50‐year anniversary in 2041. As the year 2041 quickly approaches, Robert’s goal is to ensure that the young people of today make informed and sustainable decisions for tomorrow. 2041 led the first corporate expedition to Antarctica in 2003, in which 42 people from 18 nations joined Robert on his ‘Leadership on the Edge’ program. Since then, over 400 corporate leaders,educators, students and entrepreneurs from around the world have experienced Antarctica with the 2041 team. The International Antarctic Expedition 2016 will take a team of carefully selected people from around the world to visit this fragile region. The purpose of the expedition is to groom ambassadors for education, the environment and sustainability across the globe. I am presently working as a Systems Engineer with Cisco Systems Inc., Bangalore and my primary focus is on providing solutions for Voice and Video technologies to our customers across the globe. A unique volunteering activity to create content for science and math’s chapters for grades VI - X affiliated to Karnataka Secondary Education Examination Board. 4) Partnered withParikrama Humanity Foundation for helping children from rural areas in and around Bangalore for consruction of science models. Robert Swan and 2041 have invited me and a few other young people across several nations to be part of the International Atlantic Expedition 2016 and sensitize people to the threats of climate change. These people, including myself, are expected to raise our own funds to make the expedition possible. The money raised will be used to cover my expedition fees, travel, Antarctic safety equipment and any other cost that I may incur to mobilize the masses. I believe this expedition will help me to groom, shape and define my future role as a global climate change player. The money raised will be used to cover my expedition fees, travel, Antarctic safety equipment and any other cost that I may incur to mobilize the masses. I believe this expedition will help me to groom, shape and define my future role as a global climate change player. 1. Why should I support an individual for the International Antarctic Expedition 2016 ? - This reminds me of Robert Swan's words, "The greatest threat to our planet is the belief that someone else will save it." The entire globe is being affected by Global Warming and numerous studies have indicated the devastating effects of the melting of glaciers. Research shows that if this region were to melt the ocean levels would rise by 200 meters which could lead to the death of millions of people across the world. Whatever affects us here affects the entire globe and also Antarctica - the last great wilderness on earth. I would be one among the sixty young people across several nations who would be groomed to become leaders who can embrace all forms of life thereby creating a sutainable environment. 2. What activities will you carry out post this expedition ? - I would be grateful to individuals who contribute towards making this dream come true. I will be participating in promotional activities for organizations which sponsor me both pre and post the expedition in order to create awareness within the community on the threats to climate change and the disasters it can bring upon the entire planet. I am presently contacting NGOs, brands and businesses which are committed to combating global warming and towards building a sustainabale environment. 3. What is in it for the organizations which sponsor your expedition ? - The sponsors would have their insignias featured on either my expedition attire or their flags which I would carry and would be prominently featured during the flag day for all sponsors during the course of the expedition. - I would also be participating in some of their promotional activities prior to and post the expedition.